This leg move does all kinds of amazing things for your body. Adding reverse lunges into your regular rotation will do for your body what you should be doing for your car: delivering a routine, total-body tune up. The single-leg move will increase stability, fix muscle imbalances, reduce knee and hip pain, and even help you walk better in heels, says Darin Hulslander, certified strength and conditioning specialist and personal trainer with This Is Performance. And just like a wax and shine, that step-back-and-squat will build your booty and sculpt your legs. How to: Stand with feet shoulder-width apart, hands at side or on your hips. With your right foot, step back about one and a half times your normal stride length, landing with the ball of that foot on the ground and your heel up. Lower the back leg straight down until it gently grazes the ground or close to, creating a 90-degree angle in the front leg. Push through the heel and midfoot of the front leg to return to standing, bringing your right foot back in line with your left. Repeat on the left side. That’s one rep.
“The reverse lunge is probably the best overall single-leg exercise you can do." Form notes: Ensure the toes and knee of your back leg are facing the same direction throughout the entire move to keep your knees healthy. And make sure you’re fully bending the back leg, or it’ll cause a strain in your hips. If you feel any pain, don’t go down as far, Hulslander says. If you need stability support at first, do the move next to a ballet bar or wall to help as you lower and raise. And if you have limited ankle or hip mobility, try Hulslander’s prisoner reverse lunges first: Place your hands behind you head as you step back, lower, and return to start. This helps open the chest, keep a more neutral upper back, and reduces the strain on already tight tendons, he explains. Work your way up to hands on your hips. Reps/sets you should do to see results: Do eight reps on one leg, then switch and repeat on the other side. Complete three to four sets total. “The reverse lunge is probably the best overall single-leg exercise you can do,” Hulslander says. For starters, the move actively targets the quads, glutes, and hamstrings—which means it’s strengthening and sculpting your entire backside. It teaches the knee to stabilize itself over the toe—great for your running technique—and it’s easier on your knees than the typical lunge since stepping backward calls for less shearing of the joint. 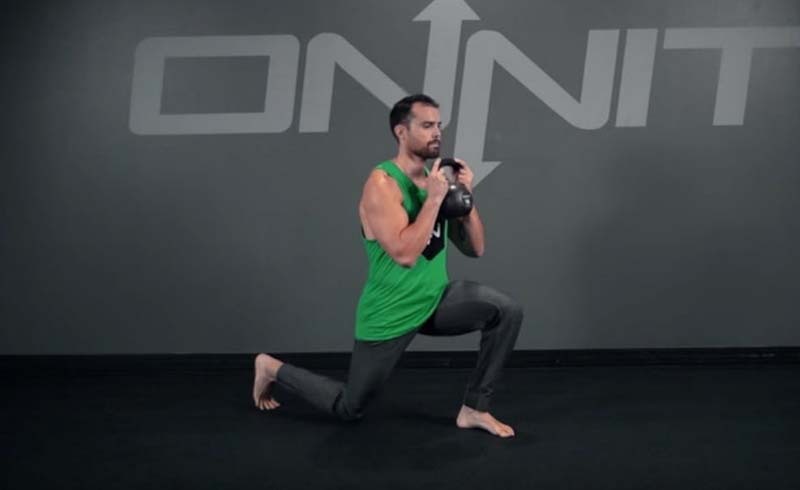 Additionally, reverse lunges improve your range of motion and mobility, which will cascade into boosting pretty much every aspect of your life. “A lack of ankle mobility is one of the main causes of knee pain I see, while limited hip mobility contributes to lower back pain," Hulslander says. In addition to less pain, you can expect this move to help with everything from squatting deeper to picking your kids up off the floor. To top it off, this move teaches your body how to shift your weight backward—something you rarely practice but often need, like when someone comes around a corner too fast or you misstep in high heels, Hulslander points out. Beginners should start working reverse lunges into their routine twice a week, just using bodyweight. Once your body is used to all the stability work, Hulslander advises leveraging the move as often as every workout. He likes to do one or two sets of five reps as part of a dynamic warmup because, "it creates a nice stretch in the glutes, and gets the brain thinking of how to do the exercise." In a workout, pair reverse lunges with an upper-body move during circuits so your legs can get adequate rest from such a demanding movement. Or make them a part of your HIIT routine (but keep it weight-free since you want to execute it fast, but with proper form). And program the move toward the start of your routine since it's "a more taxing movement and you don’t want to be too fatigued or your form and balance will suffer,” Hulslander says. Throw a towel or slider under your back foot, which will force the front leg to work much harder to stay stable and keep the back leg from sliding out too far. If your goal is muscle building, add weight to the bodyweight move—like a dumbbell or kettlebell.